Kent had the most liked content! New Zealand, because they are the Canada to Australia's USA. With a team in the neighboring countries bigger league. Wales was usually the comparison, but New Zealand was the next example. A nice read. It's kind of funny to me. A lot of people here pointed to New Zealand for why a league here could work, and now this guy is doing the opposite. It could be that the TFC academy is one of 4 pro clubs (3 MLS and FC Ed) with academies in Canada, and Uruguay have 16 teams in their top tier, and another 15 in their second tier, presumably all or most of those teams have academies. So in a match between TFC and Penarol we are putting a large portion of our talent pool against a much smaller portion of their national level talent pool. It wasn't Bono against Seattle. It was that new guy, Westberg. Bono has been bad so far this year though, you are right about that. I hope they make the numbers available too, no matter how good or bad they are, but just a word of caution. The smart money is probably on a dip in attendance in year 2. After MLS's first year the average attendance dropped in each of the next 4 seasons. There will probably be some amount of a novelty crowd in year 1, and the novelty will disappear. MLS didn't match/surpass its 1st season attendance average until its 16th season. Hopefully it doesn't take CPL that long, but I just wanted to make sure we have realistic expectations and not think that it's a given that attendance numbers will only get higher and higher. Updated the original post with Petrasso, Malonga, and Welshman. I'm not actually sure how many caps Malonga has. Transfermarkt had him at 5 and also 7, and soccerway mentioned 2. So I just picked one. If anyone has reliable info on him (or can just point out how stupid I was somehow) that'd be appreciated. With Petrasso signed now all teams have at least one player with senior national team caps. Now only Wanderers don't have any Canada caps. I would think the main perk to having a sparsely populated stadium is the ability to go to the washroom and get a beer at halftime. At TFC games it's often hard to pull that off. Really you have to be close to the aisle to have a chance, or to start your walk down the stairs before the half has actually finished. Crepeau's highlights from the game against Chicago. Just correcting your math. It's 10 games maximum involving MLS teams. Montreal and Vancouver are starting out in the "quarter-final-esque" round, so that's 2 games each for them in that round so 4 total. Then if at least one of them advances they will be in one semi final while TFC are in the other, so that's 4 more games bringing the total to 8. Then if at least one MLS team advances to the final it's 2 more games to bring the total to 10. And for anyone curious, it is technically possible to have all 10 of those MLS team games playing against CPL opposition. That would require a CPL team beating Ottawa Fury, a CPL team beating one of Montreal or Vancouver in the "quarter-final-esque" round, and a CPL team beating an MLS team in the semi final round. It's a very long shot for all that to happen, but it's a technical possibility. His arm doesn't even fling back at all. I know he is a strong dude, but you would expect some amount of recoil if the ball hit his arm. Definitely no "clear and obvious" handball there. I've said it before and I'll say it again. VAR doesn't solve any more problems than it creates. 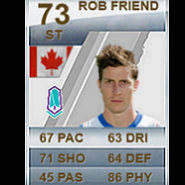 I mean, why would they put him on forward when he only got 4 goals and 1 assist in 7 games played there. Looking forward to that CBC news dropping if it is true. I hope that "across multiple platforms" part means "20 games that will be available on TV and those same games you can watch online" rather than something like "20 games that are available on either TV or online".